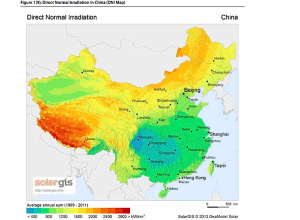 CSP (Concentrated Solar Power) is growing in China. Before, China experimented with two small-scale CSP-plants operational. Right now, China is building seven CSP plants and again zeven in the near future. By 2020 China wants 10 GW CSP. The goal for solar thermal is set to be 800 million square meters PV! De figures in the proposals assume that construction costs for CSP installed capacity will be below 3 Euros per watt (by the end of 2020). The energy generation costs are suspected to be nearly 14 Euro cents per kWh. Important in the proposals is that the CSP-installations should be promoted widely. Especially in areas with unused land, sufficient water, and a lot of solar radiation. This is particularly in provinces like Cinghai, Gansu, Inner Mongolia and other western areas. The demonstration period will be from 2016 to 2017 and includes 1000 MW of power. In these projects the overall development approach needs to be followed. Which is: overall planning, step by step implementation. 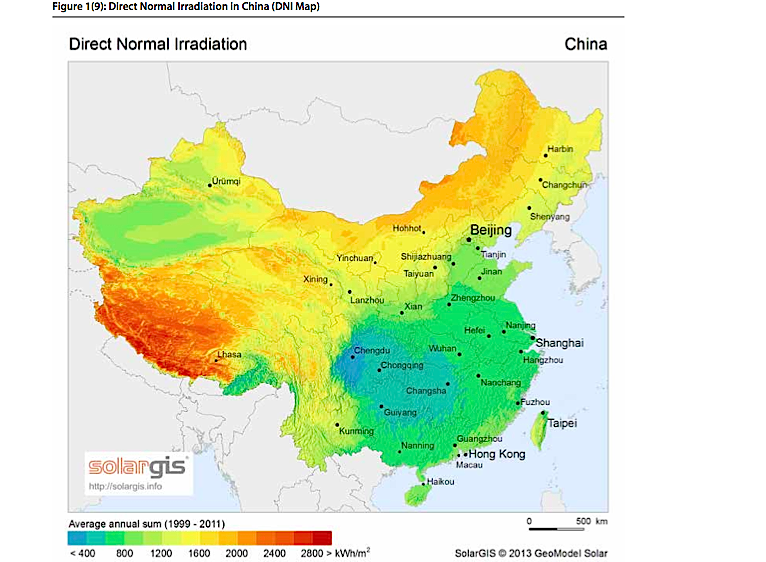 China’s western region is favorable because of it’s solar radiation or direct sunlight, available land and water resources and an accessible electricity network. In this region it is possible to instal 50 MW or more as a demonstration project. The plants can be used stand alone or in combination, as energizer for the industrialization of the domestic technologies and equipments. Four big CSP plants will be realized gradually from 2018-2020, using the experiences of demonstration projects. The proposition is to build 4 big plants with 1,000 MW in Qinghai, Gansu, Inner Mongolia and Xinjiang. Combining other forms of energy, these plants will increase to 100 MW capacity. By accumulation the experiences in building, development of the industrial chain and technological progresses and cost reductions, the role of the CSP industry will be confirmed.